The grounds crew works on the field at Busch Stadium on March 27, 2019. At long last, spring finally arrives for Cardinals fans at 2:30 p.m. Friday when the Budweiser Clydesdales take their annual strut around the warning track at Busch Stadium — a day later than planned. A rainy forecast for Thursday prompted the Cardinals to postpone their home opener against the San Diego Padres to Friday afternoon. The team promises all the traditional hoopla of opening day, including the Clydesdales and motorcades introducing the 2019 Redbirds and Cardinals Hall of Famers. As in past years, the Cardinals are telling fans to arrive early to allow plenty of time to pass through security. Stadium gates will open at noon. Pregame ceremonies begin two and a half hours later. Fans should use their tickets from Thursday’s postponed game, and they can leave their umbrellas at home. Unlike Thursday’s forecast that promised rain all day, the National Weather Service is predicting mostly cloudy but dry skies for Friday, with a high of 67. The first pitch is scheduled for 3:15 p.m., with right-hander Jack Flaherty starting for the Cardinals against lefty Nick Margevicius of the San Diego Padres. The Cardinals opened the season on the road last week and have a 3-3 record. The team has not made it to the playoffs for three years, but the season, so far, has had some promising moments: The Cardinals beat the Pittsburgh Pirates twice in extra innings. And new first baseman Paul Goldschmidt smacked three home runs in the second game of the season against the Milwaukee Brewers. The downs include Sunday’s blown save against the Brewers. The team has a good mix of young players and veterans this year, said Cardinals President Bill DeWitt III last week at Media Day at Busch Stadium. The team has a new slogan this season — “Time to Fly” — and a new powder-blue uniform they’ll wear only on the road for Saturday games. 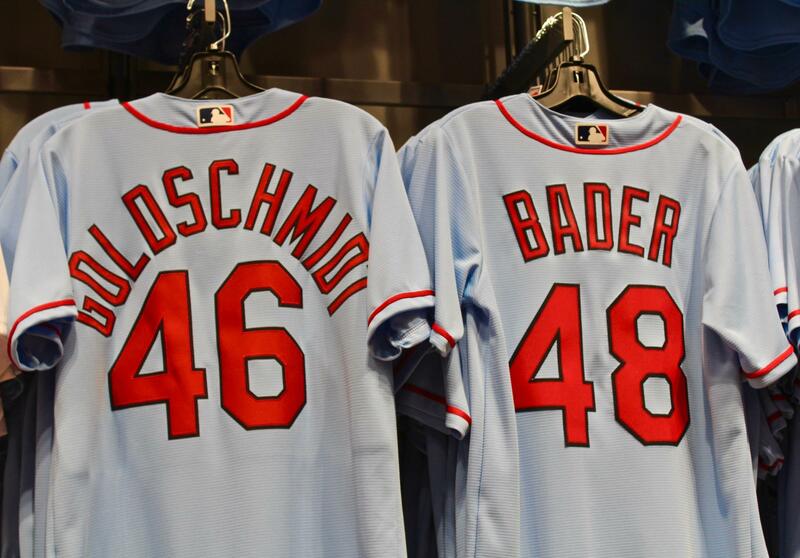 So, expect to see fans wearing powder-blue Cardinals jerseys amid the traditional red sea in the stands this season. The Cardinals have discontinued print-at-home tickets this year and will use mobile ticket delivery through Major League Baseball’s free “Ballpark App.” Fans who want physical game tickets can have them mailed or left for pickup at the stadium’s will-call window. The app will be new to many fans, but Gifford doesn’t expect it to cause delays getting into the stadium. People are using mobile tickets for concerts now and even airline tickets, he said. Gifford advised fans to have the app open on their phones as they enter the stadium, so gate attendants can scan the bar codes quickly and keep the lines moving. Stadium security remains the same. Everyone entering the stadium will walk through metal detectors at all gates and stadium entrances. All bags will be inspected. Fans should remove cell phones, cameras, and large metal objects before walking through. As in previous years, no backpacks are allowed in the stadium. Other banned items include alcohol; aluminum or glass cans or bottles; thermoses; hard-sided coolers; commercial camera equipment. Noon: Gates open at Busch Stadium. Cardinals batting practice. 1 p.m.: Padres batting practice. 2:30 p.m.: Pregame ceremonies begin, with the Budweiser Clydesdales making their annual strut around the warning track. 2:35 p.m.: Motorcade of Cardinals Hall of Famers around the warning track. Vince Coleman and Ray Lankford inducted into the Cardinals Hall of Fame. 2:50 p.m.: Motorcade of 2019 Cardinals. 3:09 p.m.: Ceremonial first pitch by Cardinals Hall of Fame nominees Jason Isringhausen and Matt Morris who pitched for the 2004 team that won the National League Championship.